They say "beauty is in the eye of the beholder". And I say: it's easy to be inspired in the life when beauty is all around you! Kazu "lepota je u oku posmatraca". A ja kazem: lako je biti inspirisan u zivotu kada je lepota svuda oko vas! You are certainly beautiful in your outfits and posts. You're beautiful all around with your outfit(s) here. Looking great, Jelena! although I 'm Greek I cannot be at the beach right now, and I'm so jealous! you look stunning, ...what a body...! Bas uzivam u ovim tvojim postovima sa mora!!! Divna si mi Jeco bas.. slike su savrsene!!! Το μπικινι αυτο σου παει παρα πολυ! I'm not that jealous of you any more, I got to go to the two times thus week :). Prelepog li mesta! Ljubomoran sam! i am so jealous of you right now!! i wish i could lay by the beach as well :) perfect! These are such beautiful photos and you look so beautiful dear!!!! L.I.K.E......... great - awesome- gorgeous - style - biG Big bIg!!!!! Ooooh I love that bikini! You look fabulous!!!! What an amazing setting - you are making me so jealous! Summer, i hope you ! Amazing post! And I really, really love the pictures! Stunning! you look amazing!!!! i hope youre well babe! the bikini is also gorgeous! Lucky you. I'm so envious. Oh wow what a beautiful place! I can't wait to go to beach this year! So envious that you get to spend all that time by the gorgeous ocean!! LOVE your nail color! wow, looks absolutely picture perfect... have a wonderful trip! 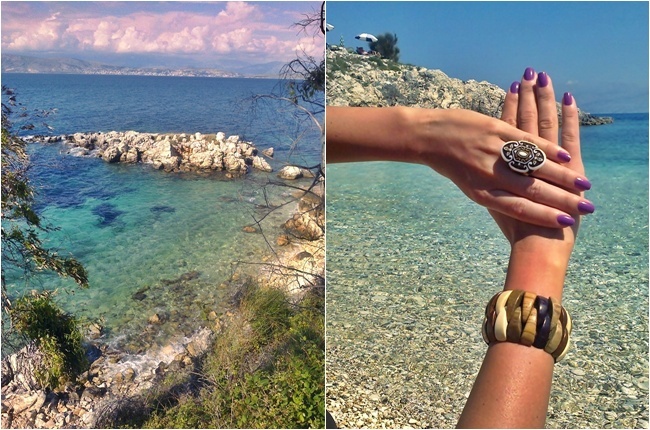 It is for sure easy to be inspired in life when beauty is all around, as is evident in Corfu. Love your bracelet. thanks for stopping by on our blog :) we followed you!